The call centers are a type of retail channel that enables new sales order entry features. Some of those features include sales order recap, integrated payments, continuity orders, advanced upselling and cross-selling, installment billing, fraud checking, order holds, scripting, and price overriding functionality. Call centers are designed primarily for retailers that have a call center which takes orders and handles other customer requests. They are meant to foster mainly B2C relationships; however, they can be used to help manage B2B relationships as well. There can be multiple call centers, and each one can be configured to meet different business or order expectations. In addition, each call center may have different financial dimensions or cost centers. Once a call center is created, catalogs are added to it. Each call center can have its own users, payment methods, price groups, financial dimensions, modes of delivery and so on that are configured at the time of creation of the call center. When you set up a call center, you'll need to start by enabling specific features for the call center. When you create the call center, you can choose to enable order completion, which enables the complete button and the order recap, for example, on the sales order form. You also have the option to enable the directed selling option. This option enables the order scripts, catalog requests, additional item information and so on in the sales order form. The last feature that you can enable is the order price control. This option enables price matching, price details, price overrides, and margin alerts. Enable order completion -Select this check box to enable the following features for call center users in the Sales order form. The Complete button – This button controls access to the Sales order summary form where the user can enter payment and submit the order. If the Enable order completion check box is not selected users can create and save orders but cannot complete them. The Recap button – This button controls access to the Sales order summary form where the user can review the order and optionally enter payment and submit the order. The Coupons button – Coupon calculation requires that the order be completed. Next, you'll need to create a price group and attach it to your call center. You can use the same retail price groups that are used with your other retail channels or you can create new retail price groups that will be linked to your call centers. 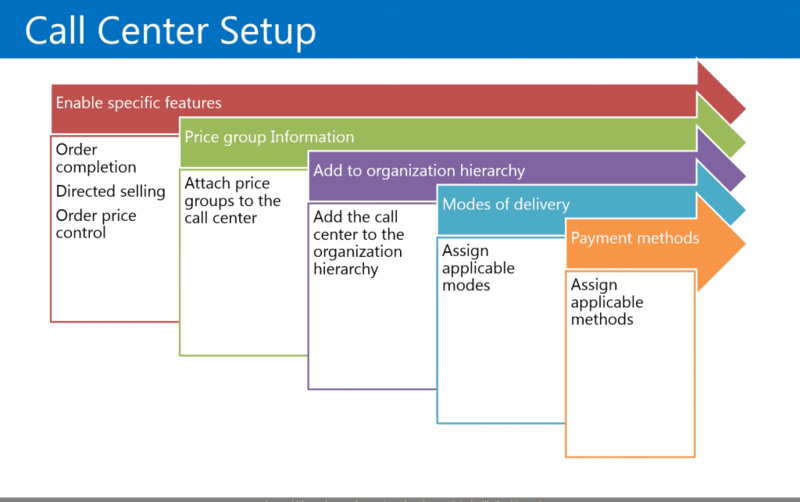 After you've completed the basic setup of the call center, you'll want to add the call center to your organization hierarchy. Then you'll need to assign the applicable modes of delivery to the call center. By linking in the modes of delivery, you're defining which modes of delivery will be available in the sales order entry screen. Finally, you'll need to select which payment methods will be applicable and available in your call center. You can also optionally add attributes to your call center. Attributes are used to add descriptive characteristics to the products that the call centers offer. Once you assign the channel product attributes to the call center, a channel hierarchy can be assigned and associated with the hierarchy. The channel hierarchy is a component of the process that's used to add the products to the catalogs that are created for the call center. Create a new call center. Enter name of new call center, in the search name, you can type in an updated search name. And in the warehouse drop-down box, you'll need to select the warehouse for this particular call center. 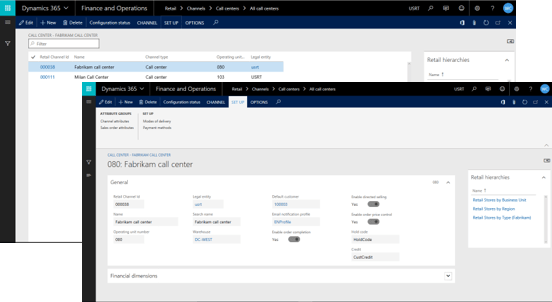 Then in the default customer you can select the default customer that will be used with this particular call center. You can optionally select an email notification profile, and in the call center group you can enable order completion, directed selling, and order price control. And then select reason codes to be used for the price override, hold codes, and credits. You can optionally add financial dimensions to your call center as well. For example, to link this to the retail channel, use the drop-down box to select the appropriate retail channel. Now that you've selected the appropriate financial dimensions, then you can close the form. 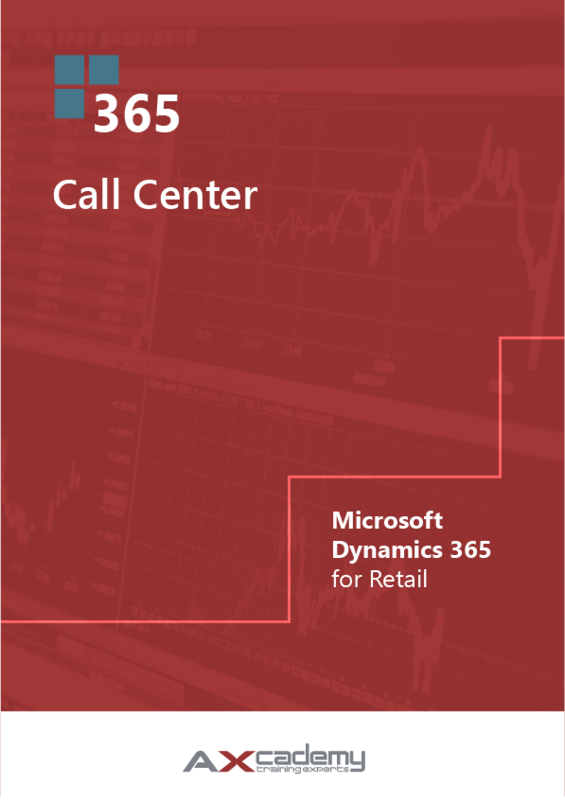 The above text is an excerpt from our training material Call Center in Microsoft Dynamics 365 for Retail, available in our webshop.